Sandra Bilboé is an artist. This vivacious Franco-Brazilian woman paints on glass. Her work reflects her childhood spent in the heat of the equatorial forest, the joy of a shimmering life, where colours seem to spin like the beginning of a firework! The transparency of the glass combined with bright colours make singular depictions that were exhibited at the Metropolis Shopping Center in Monaco. Fashionista, it was a short step for this designer to develop her passion, which she did by… creating her own women’s shoe label. 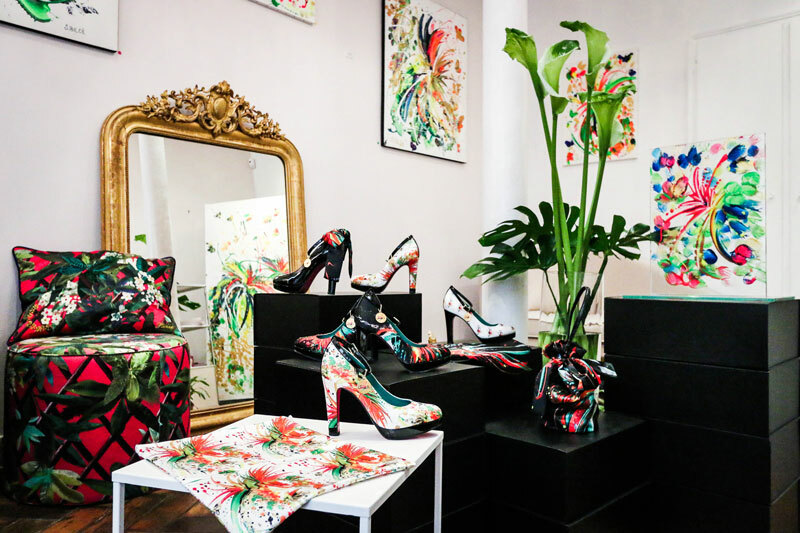 Known as Fashion Strelitzia, in the heart of the 6th arrondissement, she creates unique designs, extensions of her work, singular and colourful. We fell for those shoes, so feminine, turning into a painting once the left and right foot are joined together. You’re either an artist, or you’re not.